Mobile tickets are available for most routes on Loco2. Simply save your ticket directly to a suitable device and present to the ticket inspector on board. Which tickets are available as mobile tickets? Trenitalia (Italy) "paperless" tickets - Though not strictly mobile tickets, "paperless" tickets for Italian trains can be presented on your phone in much the same way. Renfe (Spain) - Again, not strictly mobile tickets, but for domestic journeys you can present print-at-home tickets on your smartphone or device. Mobile tickets are available for thousands of journeys, with more coming soon. Where mobile tickets aren't yet available, choose from a range of other Ticket Delivery Options. 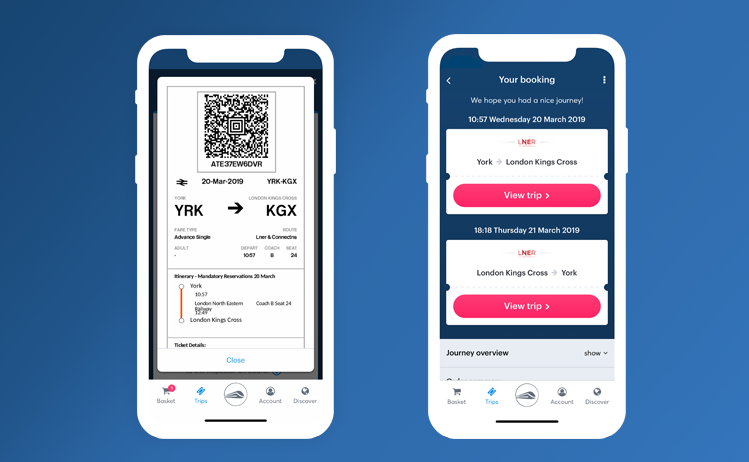 UK mobile tickets issued by Loco2 can be displayed either by showing the PDF file you received with your booking confirmation, or by using our app. After selecting your journey from the "Your trips" section of your account, you will be able to view your journey and tap where indicated to view your tickets. 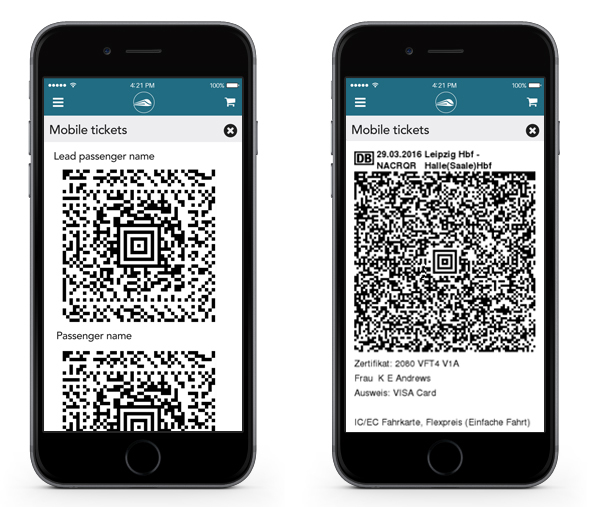 The exact format of mobile tickets varies between rail operators, but the standard format includes a two-dimensional barcode (or "QR code") which the ticket inspector scans directly from your device on board the train. The name of a specific passenger will normally be associated with each ticket, but not always - German mobile tickets will only show the name of the lead passenger. 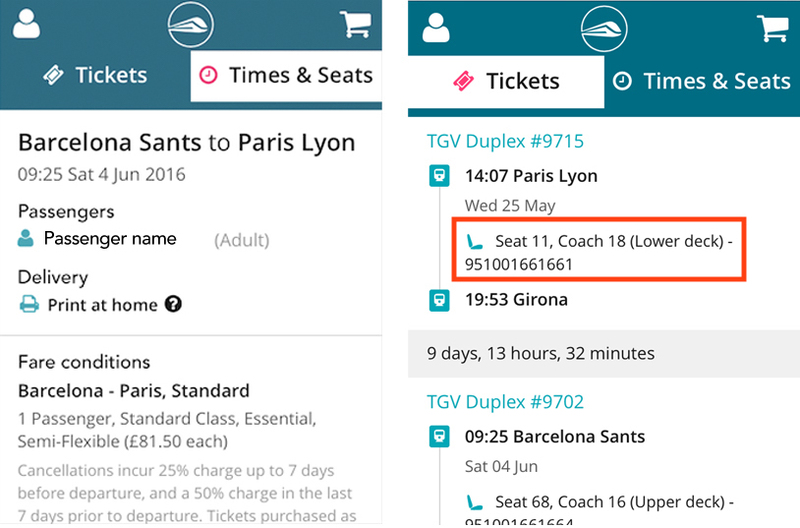 Some mobile tickets display details about your journey, including train number, departure time and your seats. Some are more simple, containing only a barcode. If your mobile ticket doesn't include information about your train times and seats, you can find this information in your booking confirmation email or in the "Your trips" section of your account. How do I present a mobile ticket? Mobile tickets can be presented on any suitable device including iPhone and Android smartphones and tablets. This can be done through your account using the Loco2 app or mobile site. Mobile tickets are also included as an attachment to your confirmation email so you can access them via your email as well. Once you've located your mobile tickets you can present the barcode to staff on board the train for inspection where your ticket will be read by a hand-held scanner. For some UK stations you may also need to present your mobile ticket to pass through ticket gates. It is your responsibility to make sure that the battery of your device is charged so you can present your mobile ticket to the inspector. For long trips or to be on safe side, we recommend investing in a portable charger. UK mobile tickets can also be printed as a backup if required. The screen of your device should be free from damage like scratches or cracks, in order that the barcode can be clearly seen and easily scanned. Choose a different delivery method if you have any doubt about whether the a mobile ticket will be readable since neither Loco2 or the rail operator is responsible if ticket cannot be read from a damaged screen.